This a monthly series which I have been publishing for years. You can subscribe here, to get the latest cheese delivered directly on to your screen. On my first research trip to Poland in August 2014, in an organic grocery store in Warsaw, I came across cheeses made by Bożena and Daniel Sokołowscy. They keep around a hundred goats on their organic farm Kozia Łąka Sery Łomnickie not far south from Jelenia Góra in Lower Silesia, overlooking the Giant Mountains with the Schneekoppe peak. As back then I only know about the last fact from the internet and reports – I still haven’t made it there, shame on me and mea culpa… but the turophile’s destiny is stubborn: during a recent short visit in Poznań, having been invited to judge a Polish wine competition by and at the food and art hub SPOT (super inspiring, go! 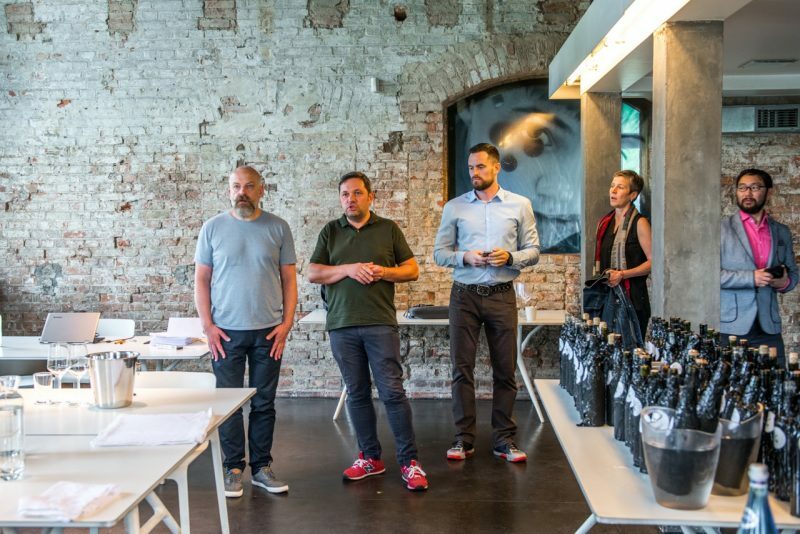 ), as usual a little pressed for time but very happy to meet all those people and taste all those wines, amongst the winegrowers at the large final tasting stood – the goat farm Kozia Łąka Sery Łomnickie! That’s exactly why serendipity is my favorite word… As I said, time was scarce, and therefore I didn’t take a picture of them, but I did buy cheese. Which brings us, finally, to my cheese of the month (fanfare! ): the mature goat cheese from Kozia Łąka Sery Łomnickie, Ser dojrzewający kozi naturalny. Way back at our meeting in August 2014, Heinzelcheesetalk #4 (meanwhile we’re at #42 – my gratitude goes to all of you who continuously show so much interest! 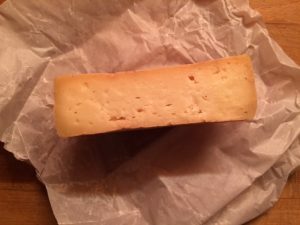 ), we liked that cheese, and what I wrote then – „obviously ripened with a variety of cultures and the rind brushed clean; the taste complex and multi-layered, the texture dry, but not too dry, salty, but not excessively so“ – is still true. A modest, gorgeous cheese that pushes an excursion to Lower Silesia to the top of my travel list. There is another reason to travel into that direction: Winnica De Sas in Krośnice, a short drive north of Wroclaw. 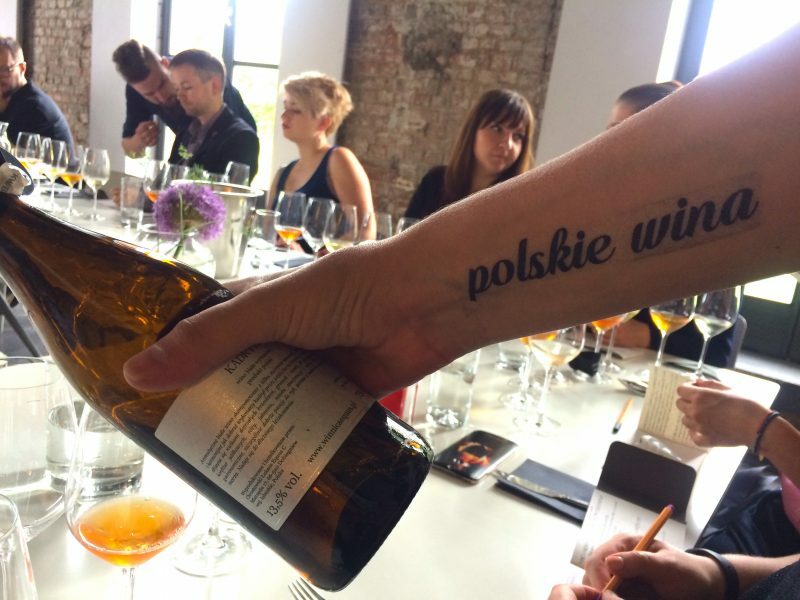 Anna Zuber and Leszek Budzyński planted their first vines in 2006. 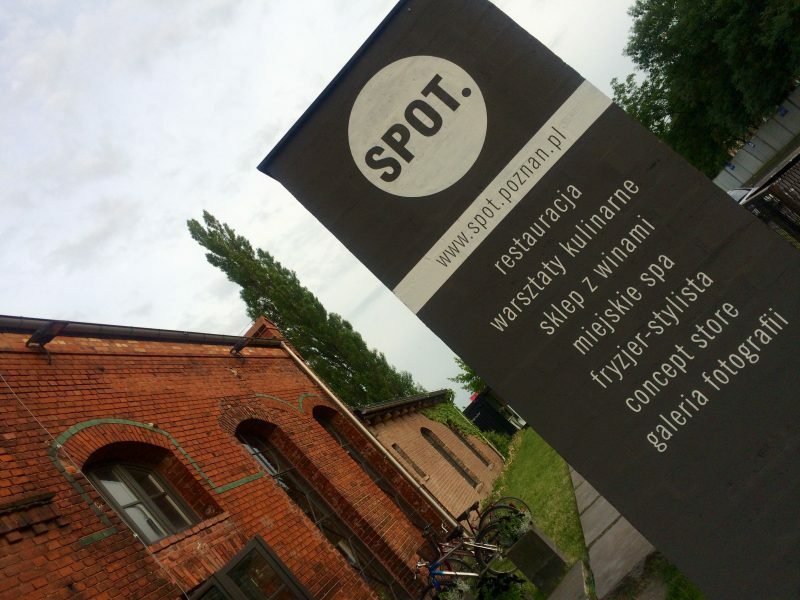 I met them too at SPOT in Poznań. They work as close to nature as possible and are experimenting with various vinification methods. 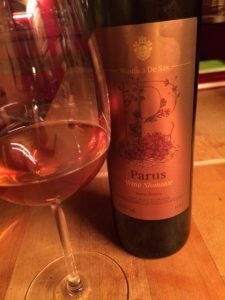 Anna sent me a bottle of their Parus Słomowe to Berlin, where it arrived just in time for the HeinzelcheeseTalk with the Polish cheeses and paired super well with our favorite. Riesling grapes were left to dry on straw during four months, to be wild fermented for one and a half months into an unfiltered, unsulfured wine that is completely dry but tastes as complex as the best honey, with an idea of nuts like mature, dry Oloroso sherry. The cheese enjoyed that very much, and so did we. Let’s go to Poland.